Finish off your CD’s or DVD’s with our fantastic disc on body printing service. Whether it is a simple home movie or an important musical recording Testa-Rossa can take on all your CD and DVD printing needs at an unbeatable price. There are three printing types available to compliment our CD duplication service; black text on silver CD, grayscale print on white CD and full colour gloss print on a white CD. For CD replication we can print your discs using offset litho or screenprint.You can also choose the style of casing which range from cardboard sleeves to jewel cases. 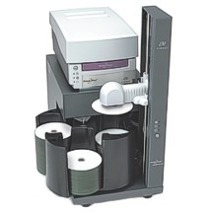 Testa-Rossa has two main types of DVD printing solutions available for short run DVD duplication. The first is a greyscale thermal print on silver or white Sony discs. The second DVD printing service is a full colour thermal print on Sony’s white discs. All the discs we use are high grade Sony discs which provide the best possible reproduction. There are various methods of printing onto the surface of a CD or DVD disc depending on whether we use duplication or replication. These include black text thermal print, grayscale thermal print, full colour thermal print, screenprint and full colour offset litho print. This page highlights the most popular methods used and a guide to suitability. If you are unsure of the best print method for your order please give us a call or email a copy of your on body artwork and we will advise of most appropriate print method. Black thermal text print is the fastest and most cost effective option for short run duplication up to 500 units. This option offers up to 600 dpi resolution for black text, logos and graphics. We use a Rimage Prism printer to print your design from thermal ribbon at high temperature onto a reflective silver Sony disc. The finish is durable, smudge proof and moisture resistant. Grayscale thermal print is a cost effective option for short run duplication up to 500 units. This option offers 600 dpi resolution for black/grayscale photo images, logos and hi res graphics. We use a Rimage Everest printer to print your design from thermal ribbon at high temperature onto a white or silver Sony disc. The finish is glossy, smudge proof and moisture resistant. Full colour thermal is the best option for fast turnaround short run duplication when full colour is required. This option offers 600 dpi resolution for full colour designs. We use a Rimage Everest printer to print your design from thermal ribbon at high temperature onto a white Sony disc. The finish is glossy, durable, smudge proof and moisture resistant. Colour inkjet print is a great home solution for very short runs of up to 50 units. Colour designs are printed with CMYK inkjet print onto a disc with a special inkjet surface. This method uses water based ink and the printed disc will always be prone to smudging and moisture damage. Testa-Rossa no longer offers an Inkjet option due to poor print durability. 2 Colour screenprint is the most cost effective print solution for replication orders of 500+ units. Any 2 colours from the pantone solid coated library can be used or white base + 1 pantone colour. Without white base any white areas of your design will actually be the reflective silver surface of the disc. Glossy durable finish. 5 colour screenprint can be used for replication orders of 500+ units. Print can be up to 5 spot pantones or white base + CMYK. Spot pantones are ideal for consistent areas of vivid colour and for smooth vector based text and graphics. White base + CMYK process can be used to create full colour print with a glossy durable finish. Full colour offset litho is the most suitable option for orders of 500+ units when highest quality full colour photo on body disc print is required. Print is white base + CMYK and is ideal for high detailed backgrounds, photo images and text effects. Solid pantone colours are not reproduced as well as screenprint. Print finish is highly durable. Very popular for DVD disc print.